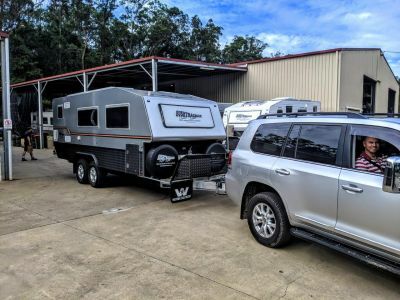 Bushtracker Forum :: View topic - NOW HERE IS SOMETHING FUN!! 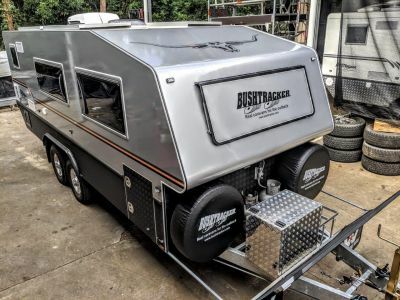 One inventive Bushtracker Owner has personalised his Bushtracker with his own Lifestyle... Interesting Person, used the User Name "Cowboy" for a while... The Harley People had already been calling me Cowboy for dressing in western clothing riding the Harley... A product of 15 years competing horses raising my Daughters with horses, I signed off "Cowboy" for a number of years. I am still called Cowboy on the Hog.. This Owner still lives it!! 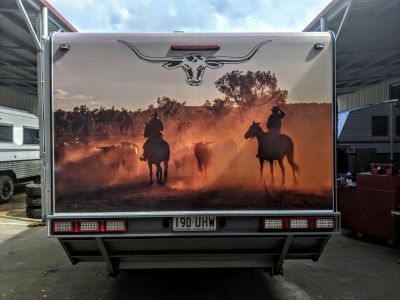 Cowboy at heart, Cowboy by nature, and look at the artistic thing he has done to his new Bushtracker!!! Good on Ya Cowboy, nice job there !! 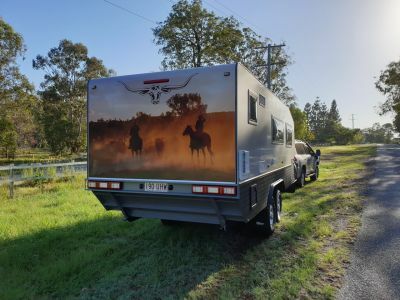 Thanks Steve (AKA Cowboy ) I Couldn't be more happy with my Bushtracker caravan, absolutely love it. 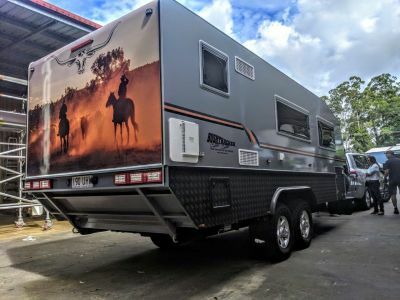 You and your team of professionals produce an absolute master piece of a caravan. Thank you. Posted: Tue Apr 16, 2019 5:36 pm Post subject: Lenght of mudflap. The van looks great and will certainly be the talking point where ever you go. Can you please tell me the length or drop length of the mudflap? 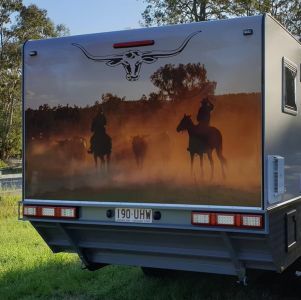 The Western Star mud flaps measure 600mm in length x 450mm drop. Thanks for that info. Enjoy your travels. What finish have you got on the alloy chequer plate? Did BT do it or did you get it done after delivery? I got BT to do it for me while the van was still in production, It is called Raptor Coat. It's the same as their 16 Foot display van. That's where I seen it and thought what a great idea.